One of the more popular novelty dances of the late '30s was the Conga. Danced to a lively 4/4 beat with a strong accent on the fourth beat, the whole ballroom could join in. While I haven't found examples of the familiar one-two-three-kick Conga earlier than around 1938, I have seen occasional examples of spontaneous line dances popping up throughout our period. I think they are all, essentially, continuations of the old Cake Walk, and the Conga can be seen as a Latin accented Cake Walk. The Conga Line is very familiar to most dancers of today. It usually involves a single leader, sometimes wielding a conga drum, doing a one-two-three-kick with a single file line, with everyone doing a slow forward shuffle and resting their hands on the person in front of them's shoulder or waist. This line wanders hither and yon, frequently off the dancefloor and all around the available space. This particular figure was certainly common in the '30s, and is what your Conga will probably eventually devolve into, but there was a bit more variety to the original ballroom Conga. While it might be making an inevitable march towards a shuffling single file line, at least at the beginning of the dance, it could have a bit more in common with a Victorian Grand March. All couples together, move to right and then the left. Men move right, women move left, men passing behind the women. Then men move left, women right etc. Lead couple separates, the man leading the men and the women leading the woman. They circle around opposite sides of the ballroom floor, meeting at the other end and reforming couples. Once it's in a single file line, if the dancers are sufficiently aware, the men and women could alternate going out to the side (women left, men right) and then back. If the dancers are divided into couples, form a ring holding hands, then execute a "Grand Right and Left" around the circle, with women moving clockwise and men counterclockwise, taking alternating hands and pulling past to the next person. Form a circle facing inward, holding hands. Everyone moves toward the center rasing their hands, and then moves back out again. Do this a couple of times. It could also be danced in couples, with each couple executing various ad lib Conga figures (pass each other and turn, pull past with hands etc.) as well as a Rumba like time step in ballroom position. In the end though, don't overthink it. If all that will work in the anarchy of your crazy chaotic ballroom mob is a single file shuffling line, then go with that. People will still have a good time. The Conga is not about order and precision. 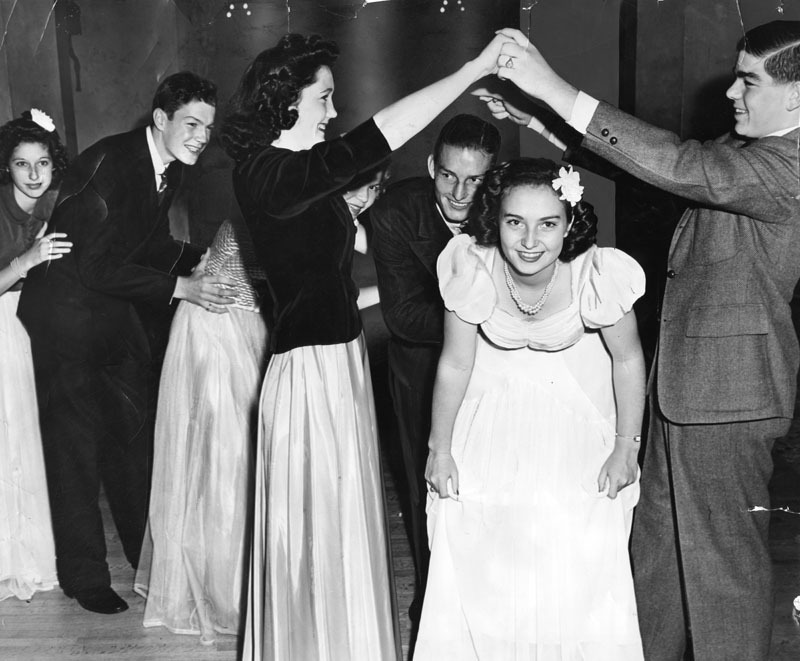 A final note: just like the ballroom hold in most of the Jazz Age dances is more intimate than modern folk generally practice, the Conga line hold was also a bit more intimate. While moderns put their hands on the shoulders of the person in front, in the Jazz Age, it was invariably hands at the waist of the person in front. Below is a clip from the 1939 short "Rhumba Rhythm at the Hollywood La Conga" that demonstrates most of the standard Conga moves - and it looks like a lot of fun. Hey folks, let's Conga like this again!